Law Enforcement Knife. 3 1/2" overall. 1 3/4" blade. One piece black powder coated 9Cr18 stainless construction. Overall profile is no larger than a credit card. Molded black composition sheath. Black cord tie included.May be laced in boot, pinned inside a belt or lapel or used as a neck knife. Hang packaged. 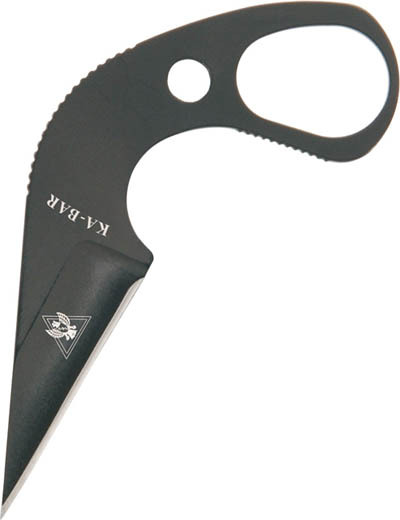 The TDI Law Enforcement Knife was designed to be used as a "last option" knife. In extreme close quarters encounters where a suspect is attempting to take an officer's handgun, or the officer cannot access his/her handgun, the TDI knife is available. Designed as an "off hand" knife that draws like a pistol, the reversible sheath can be worn on either the right or left side of the officer's belt.